Drumming taps children into the power of music, offer a means of self-expression. Drumming is such a wonderful quick-start activity that everyone, even toddlers, can do immediately. 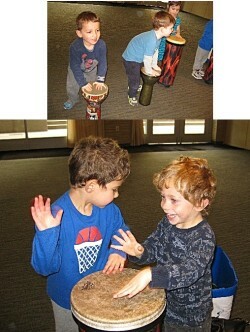 Drumming introduces the child to something that is not only a rich ancient tradition, but it is also fun to do. Studies prove that drumming calms people, relaxes the mind and adds more enjoyment to life. The drumming workshops are organized differently depending upon the age groups being taught. The workshops are ideal for a one time experience (special class assemblies), after school program or as a residency program that leads to a PERFORMANCE!. Drums are provided for the workshops. Drums can be provided for up to 1,000 Children!!! Your child will leave this experience *inspired * energized * jazzed about music, drumming, dancing and singing! COMPOSE & RECORD YOUR OWN TUNE! Bring Drumming to your school! Marla can taylor a program to fit your school’s needs!